While English Language Learner (ELL) students are spread throughout the United States, their density, or the share they represent of total public school enrollment, varies greatly by state. Western states have the largest shares of ELL students in the nation. 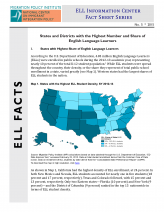 This fact sheet, drawing upon data from the U.S. Department of Education, examines the states and districts with the highest shares and populations of ELL students and offers a detailed breakdown of some key statistics. California had the highest concentration of ELLs in the United States, and nearly one-third of the country's districts with the largest ELL populations were found in California. At the local level, 25 school districts accounted for nearly one-quarter (23 percent) of all ELL students in K-12 public schools in 2011-2012. The Los Angeles Unified School District had the largest ELL population, with 152,592 students, closely followed by New York City with 142,572 students.